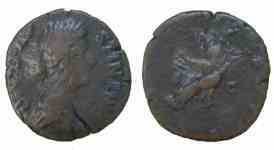 Bronze sestertius, 30mm, 18.2gm, issued c. AD 176. Rome mint. Obv: DIVA FAVSTINA PIA, Bare-headed, draped bust facing right. Rev: [CONSECRATIO] SC, Empress draped holding traverse sceptre born aloft by peacock right with wings spread. References: Sear 5227, RIC 1702. Reverse depicts Faustina the Younger being carried to heaven by the peaock of Juno.